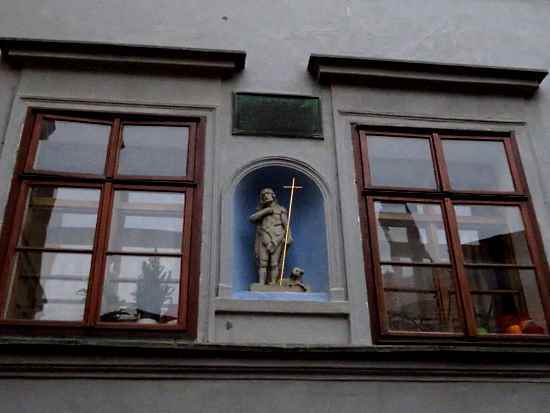 The area around Prague Castle has quite a few frightening apparitions. 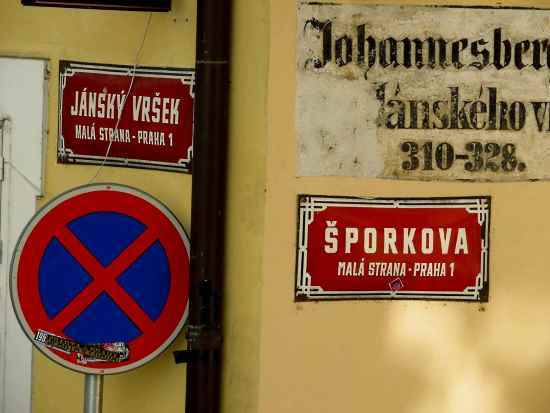 Two of the most unsettling are at Jánský vršek, just down some steps from Nerudova Street. The tale may have been one story a long time ago, as some parts overlap, but now they are so different that they must be regarded as two headless skeletons on the same street. 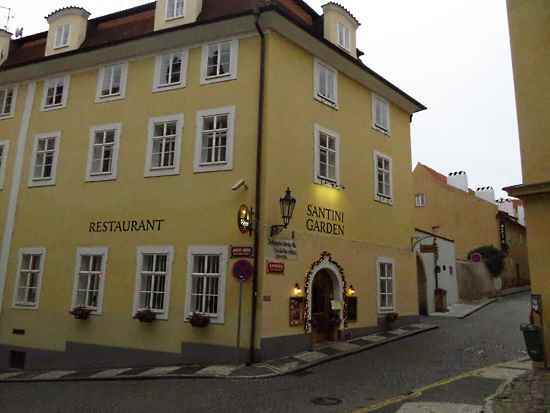 A widow who lived near Jánský vršek enjoyed the rich nightlife at the palaces around the Castle, and would come home in her carriage at all hours, making lots of noise with the wheels and hooves on the cobblestones. She often woke up a baker, who could never get back to sleep, making him too tired for work. He tried to ask her to make less noise, but if anything the impudence of the lowly baker made her even noisier. One night, as she left her coach after a particularly late party, she saw a headless skeleton wearing what she took to be an apron. The skeleton, holding its head in one arm, gestured to her with the other. Not being one for practical jokes, she complained the next day to the authorities. This sort of complaint would normally be dismissed as the result of too much drinking, but the widow had wealthy and influential friends. The baker was arrested and blamed for the apparition, even though there was no evidence. He was rather poor and couldn’t afford a lawyer, but he knew he was innocent. He thought the ridiculousness of the charge and the lack of any explanation of how he would have been able to set up the trick would get him off the hook. He was convicted though, and sentenced to a few months in jail for disturbing the peace. No sooner was the baker in jail, than the widow was out on the town again. But each time she arrived home the headless skeleton would get closer and closer. Finally, it tried to reach out and grab her one night as she exited her coach. The widow went back to the court and claimed the baker must be escaping at night, as the apparitions continued. She was assured the baker had been locked up securely the entire time. The baker was questioned about how he was continuing to create the apparitions, but he still professed his innocence and ignorance. The skeleton continued to get closer to the widow, turning up next to her in her coach and finally standing in her doorway, blocking her entrance home. But whenever she screamed, the skeleton would vanish. Nobody else, not even her driver, ever saw the ghastly figure. 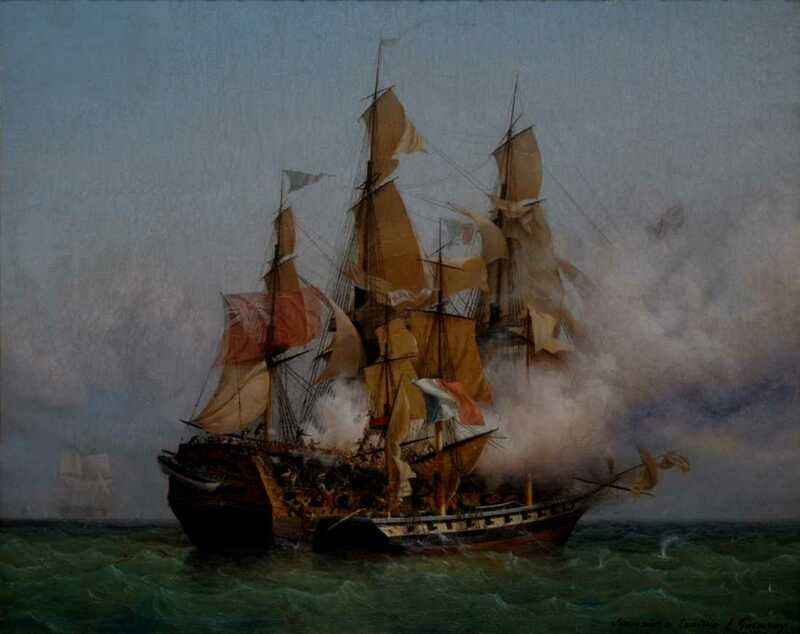 The widow could no longer take it. She had a breakdown and began ranting and raving, day and night, about the skeleton. She became unwelcome at fancy parties due to her erratic behavior, and her friends turned their backs on her. She was committed to an asylum for the rest of her days. The baker got out of jail shortly after the widow went insane, as the whole case now seemed pointless. People began to understand that the baker was not involved, and the widow was likely mad all along. With the widow gone, the baker could now get a good night’s sleep and do a proper job. 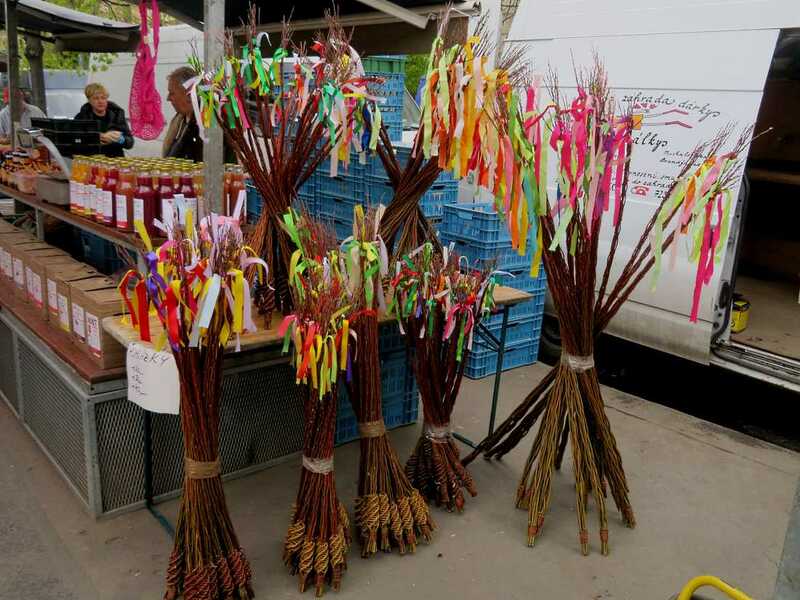 His business began to prosper. One morning, on his way to work, just before dawn, he saw a strange figure on the other side of the street, a very skinny person in some sort of striped white cloak. The person looked like a skeleton in the foggy mist, and his head, if he had one, was completely obscured by his dark hood. He carried a round basket in one hand, about the size of a melon. The baker didn’t try to talk to the mysterious being to find out if he was real or a phantom. It didn’t matter. The widow was gone, he was out of jail and his business was prospering. It was best to leave the author of his success undisturbed. The companion tale is much more vague. 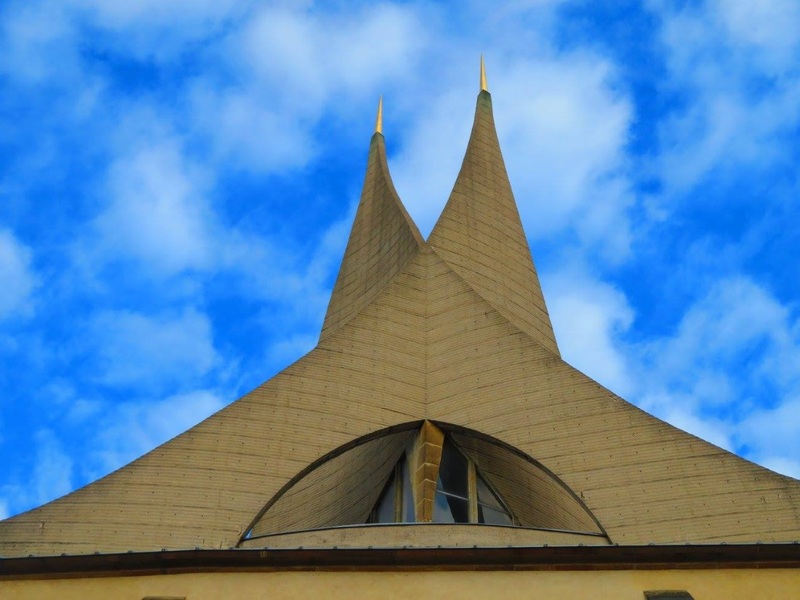 There once was a round church on Jánský vršek dedicated to St. John the Baptist, or Jan in Czech. The church gave the hill its name – Jánský vršek means John’s Hillock. There was a small cemetery there for almost 600 years, part of which is preserved as a garden but without any remaining tombstones. One of the entry arches still exists. Every Friday at midnight, a black coach drawn by black horses carries a fiery headless skeleton. The coach and its flaming rider come out of the cemetery arch and ride around the neighborhood for one hour before returning. How the skeleton lost its head, and how the phantom can be sent to a peaceful rest is not known. He committed some unforgivable sin, most versions agree, but nobody can give a single detail more. Still another headless horseman is nearby, a Swedish solider who tried to loot a church in 1638. 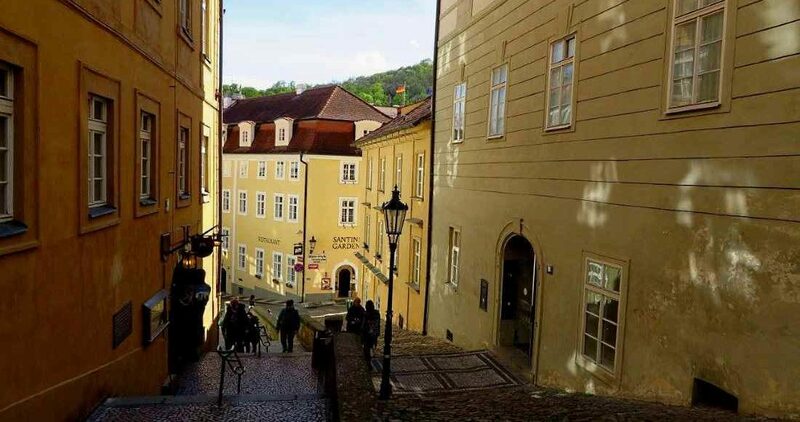 He rides around Nerudova Street and Strahov Monastery, but that is another tale completely. Jánský vršek is seldom crowded with tourists. 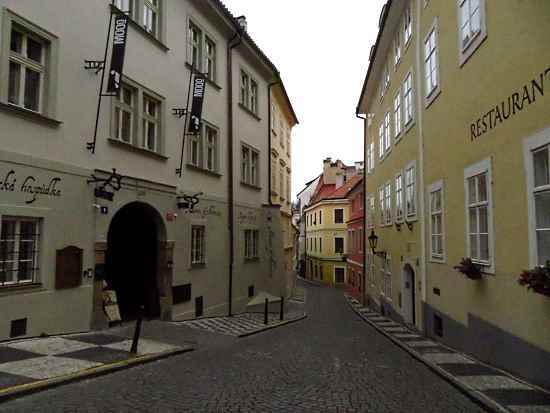 It is on a roundabout route to Prague Castle that includes several back streets. They make up an area that was once called Obora, and it had special rights granted by Bohemian queens. The area is first mentioned in 1278. It was legally separate from Malá Strana until 1656. Once the two districts were joined, the area lost its special significance. Strahov Monastery was also part of Obora. 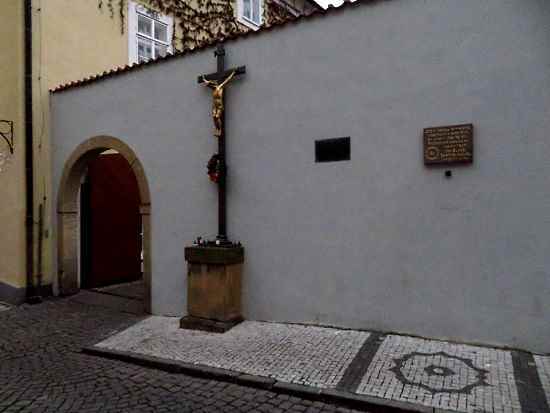 A small sanctuary and a cemetery at the site of Church of St. John the Baptist (Kostel svatého Jana Křtitele) is first mentioned in 1141. A round church was already located there by 1278, when the graveyard was used for mass burials of famine victims. By the 15th century the church fell into disrepair but was renewed in 1626. 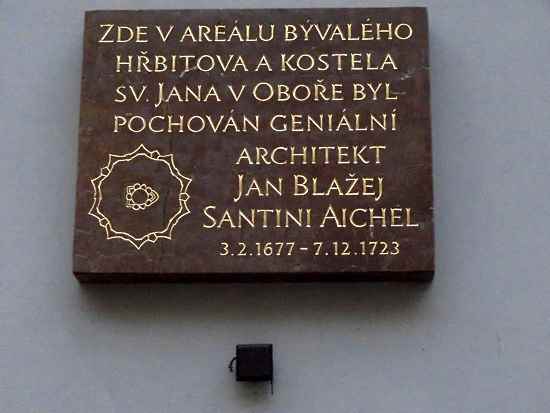 The most famous resident of the cemetery was Czech-Italian architect Jan Blažej Santini-Aichel, who died in 1723. 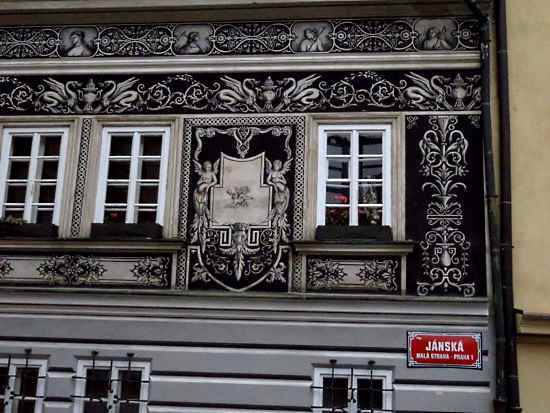 Engraver and graphic artist Jiljí (Aegidius) Sadeler, who died in 1629, was also buried there. 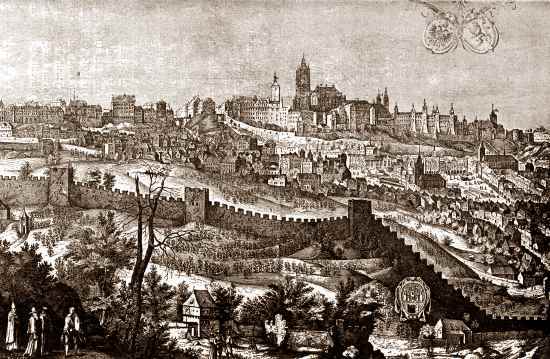 He was associated with the court of Rudolf II, and is known for his etchings of Prague’s skyline as well as famous people of his era. The church was abolished under religious reforms by Emperor Josephine II in 1784 and shut down in 1786. In 1791, the graveyard was abolished, and the remains were buried elsewhere. The church was bought by Josef Peznach, who rebuilt it into a residential house. It passed through various hands since then, with several phases of rebuilding. The last major one was in the 1930s. Between 1996 and 2005, an archaeological survey was carried out. The main part of the building next to the former cemetery is a restaurant, and the cemetery’s site is used for outdoor dining and also parking. The entry arch to the cemetery still remains, and is on Šporkova street. 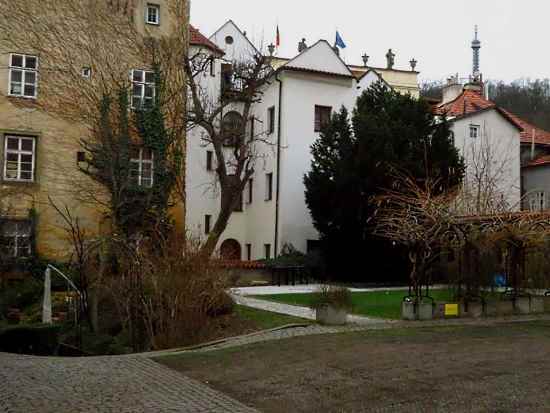 Also on Šporkova Street is a palace formerly owned by Count František Antonín Špork, who helped to bring Freemasonry to Prague and also promoted esoteric causes. Nearby a building on Jánská also has a legend. A dragon’s egg that will take a thousand years to hatch is hidden in the basement. 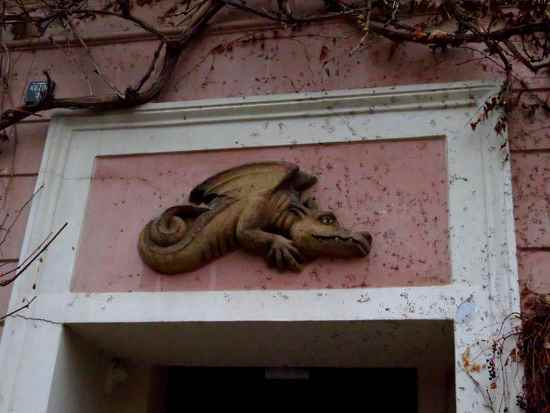 The image of a dragon is on the facade of the building, which is not open to the public. When the egg was laid is not known, so the thousand years could be up anytime. Many of the historical houses in Jánský vršek now house small hotels, or cafés and restaurants. The House of the Donkey by the Cradle (U osla v kolébce) at Jánský vršek 8 is promoted as the location of alchemist Edward Kelley’s workshop but the claim seems to have originated in the 1990s to encourage tourism. The building was recently renovated, and has a café-bar and a Museum of Alchemy. 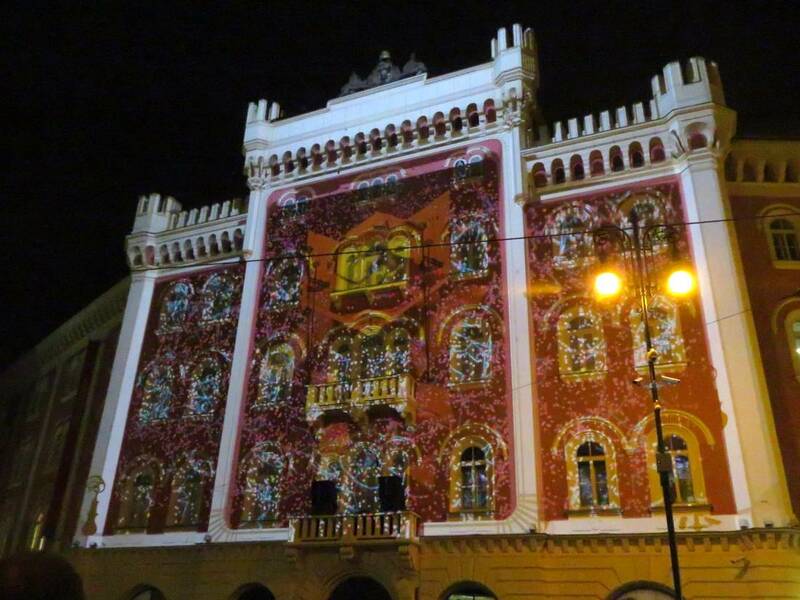 At the very top of Jánský vršek at on Nerudova Street you can find Bretfeld Palace. There is a rumor that Wolfgang Amadeus Mozart met Giacomo Casanova there during a ball while Mozart was in Prague working on the opera Don Giovanni. Both figures were in the city, and both did go to the palace on occasion. Several scholars speculate the two may have discussed Mozart’s work-in-progress. The location of the meeting, if it happened, is pure speculation.